Troubleshooting Total Access Emailer: Some Emails Not Being Sent – FMS, Inc.
Troubleshooting Total Access Emailer: Some Emails not being sent. You've verified the Total Access Emailer settings are correct for your email blast and it's generating the output you want for individual emails. 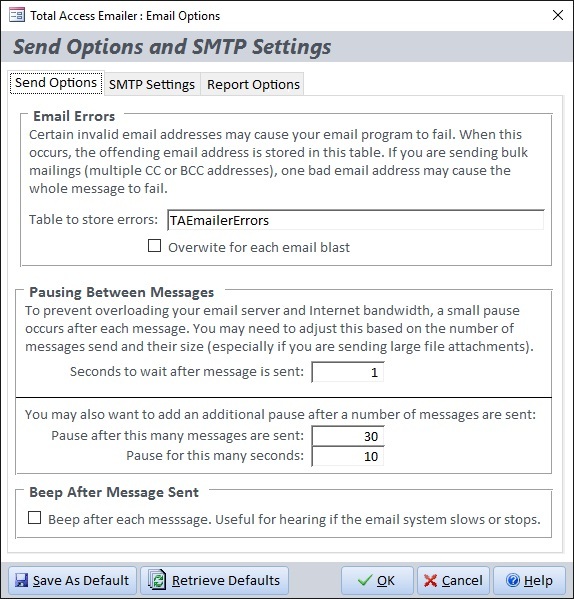 Your SMTP settings under Options are correct and that when you save it, there's no message indicating an inability to connect to it. For troubleshooting, it may be helpful to add these settings to your email blast to verify things are working. You can always turn them off later. If you haven't already, on the Auditing Tab of your email settings, specify an Audit field so the email blast can save the Date/Time it was sent. This requires the data source to be update-able and have a Date/Time field for this purpose. This may not be possible in all cases but it can help document which emails were sent if you have a large list. In the latest versions of Total Access Emailer, you can save your email attachments to disk. On the Save Files tab, turn the option on and specify the folder where it should go. This lets you verify the file attachments are correct. Use to Preview feature to send all the emails to yourself. Use an email address outside your organization (or at least the network where your SMTP server resides), to replicate what your external users experience. A Gmail or Outlook account would work. If this is successful, it confirms your email blast is designed correctly, your SMTP connection works, firewalls aren't blocking your emails, and interactions with the public Internet works. If this is not successful, we need to examine which portion of the chain is broken. If some of the emails are sent and some aren't, the problem may be the load on the SMTP Server. It may not be able to handle the amount of emails and attachments you're sending at one time. Using your own internal SMTP server rather than a commercial one like Office365, gmail, etc. Finding later emails are failing rather than the first ones. Sending to recipients with bad email addresses. Other users are adding traffic to your SMTP Server. Increase the amounts to reduce the load on your SMTP Server. Are there Bad Email Addresses? If the Preview to your own email address was successful, but emails to your actual recipients aren't, check to see if you have valid email addresses for your recipients. With bad email addresses, the SMTP server retries bad/bounced emails, so it gets progressively slower as it tries to clear the queued emails. It's no big deal for just a few bad email addresses, but over time, if your list isn't maintained, there will be more and more old emails in it. What previously worked quickly with good email addresses, may no longer be as successful. If it's your organization's Exchange Server, one can see the number of queued messages it's trying to process. If this is excessive, one should fix/skip the bad email addresses and give the SMTP Server more time between messages to process them.